A photo from 1975 featuring a Wedgwood/King's Lynn selection that played Barlaston in the midlands and won 3-2. Front Row left to right. Alan Stewart, Frank Lally, Cliff Docking, Eddie King, Malcolm Colville. Back Row left to right, Paddy Cahill, George Owen, Malcolm Flegg, Andy Sayer, Colin Dupoix, Phil Tuddenham, Richard Fyshe. I hope that all surnames are correct and apologies if not but this game took place 37 years ago.Peter Fox was the team manager and Barlaston were unbeaten for the previous two seasons allegedly. Any of these guys still living in the area? I posted a slightly blurred photograph of a Wedgwood/King's Lynn selection on the 21.7.2012 that played Barlaston in 1975. 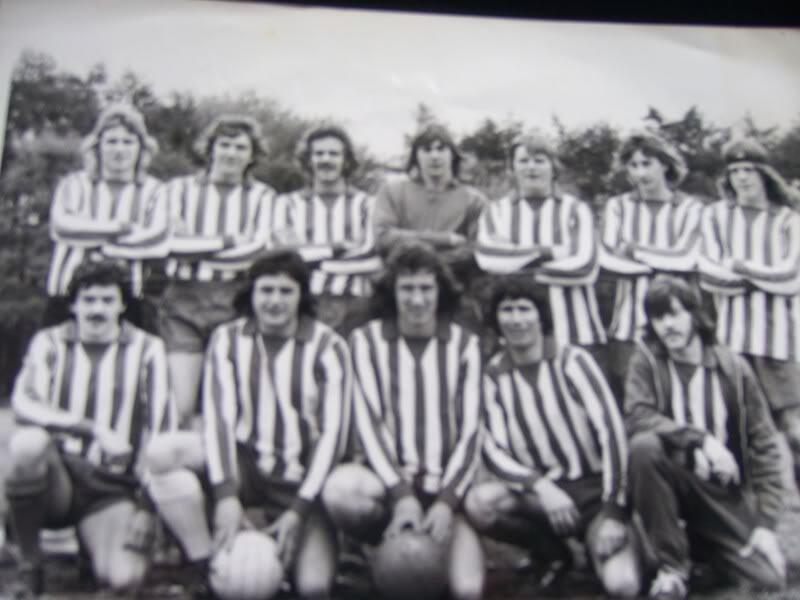 Can anybody recognise the footballers( all are named ) and if so are there any of them still living in King's Lynn? Malcolm 'Nunky' Colville was my dad unfortunatly he passed away three years ago but it was lovely to see this picture and it was actually my brother who sent me the link and he lives in Indonesia !!! Really sad to hear about ''Nunky''but nice to know you were pleased to see his photograph from way back then. On the team photo the name George Owen is a mistake. The only Owen working for Wedgewood at this time was Stephen George Owen and I know him very well.He has lived abroad for many years but he has looked at this photo and agreed that it was not him.He did play for them a few times and they used Campells soups football ground and he remembers most of the players on the photo.